This article is about amplitude in classical physics. For other uses, see Amplitude (disambiguation). are arbitrary constants representing time and displacement offsets respectively. 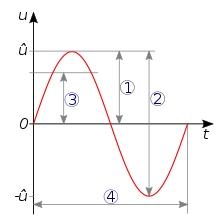 With waveforms containing many overtones, complex transient timbres can be achieved by assigning each overtone to its own distinct transient amplitude envelope. Unfortunately, this has the effect of modulating the loudness of the sound as well. It makes more sense to separate loudness and harmonic quality to be parameters controlled independently of each other. ^ Knopp, Konrad; Bagemihl, Frederick (1996). Theory of Functions Parts I and II. Dover Publications. p. 3. ISBN 978-0-486-69219-7. ^ Tatum, J. B. Physics – Celestial Mechanics. Paragraph 18.2.12. 2007. Retrieved 2008-08-22. ^ Regents of the University of California. Universe of Light: What is the Amplitude of a Wave? 1996. Retrieved 2008-08-22. ^ Goldvais, Uriel A. Exoplanets, pp. 2–3. Retrieved 2008-08-22. ^ Department of Communicative Disorders University of Wisconsin–Madison. RMS Amplitude. Retrieved 2008-08-22. ^ Ward, Electrical Engineering Science, pp. 141–142, McGraw-Hill, 1971. ^ a b "Additive Sound Synthesizer Project with CODE!". www.pitt.edu. ^ "Sound Sampling, Analysis, and Recognition". www.pitt.edu. ^ rblack37 (2 January 2018). "I wrote a Sound Recognition Application" – via YouTube.